When he (Pilate) was seated on the judgment seat, his wife sent to him, saying, ‘Have nothing to do with that just man: for I have suffered many things this day in a dream because of him . . .’ When Pilate saw that he could prevail nothing . . . he took water, and washed his hands before the multitude, saying, I am innocent of the blood of this just person (Matthew 27: I9, 24). Surrounded by soldiers but unbowed, Christ awaits Pilate’s decision. 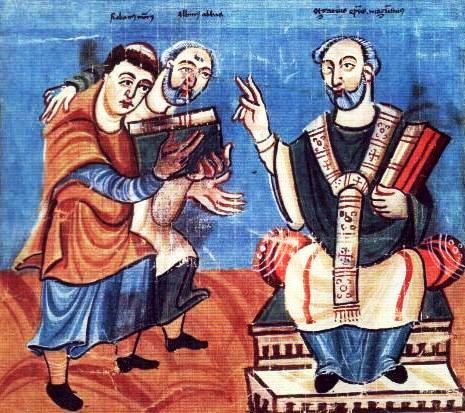 His wrists are bound and the long sleeves of his blue robe cover his hands, so that he appears entirely helpless. Pilate holds his hands over a golden basin as a servant pours water over them from a jug — a public disclaimer of responsibility. His lovely wife, who has failed to persuade him to save the prisoner, leans out from behind the throne. Medieval authors, following Rabanus Maurus, envisaged Pilate’s wife as a tool of the devil, who sent her a dream in a last effort to prevent Christ’s death on the cross and thus to thwart the plan of salvation. 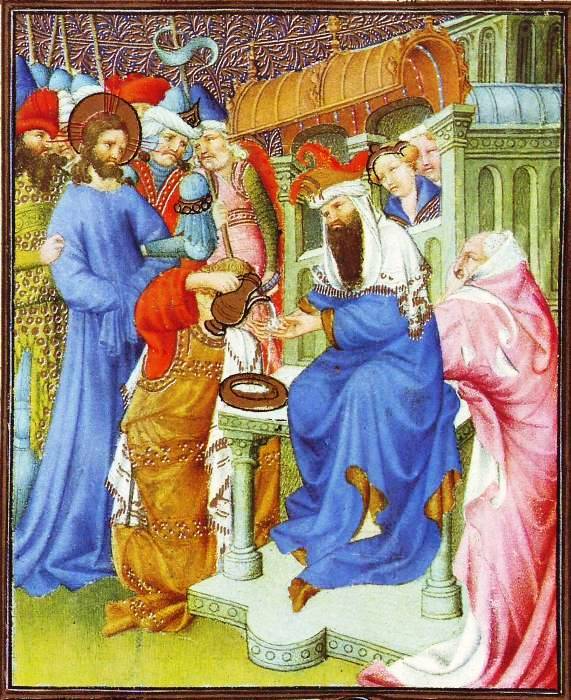 The artist of the Book of Hours has again given Pilate a hat that looks like an exotic tasselled bloom. Is it meant to show him as effete? The whole picture seems ﬂowery, with its array of bright red, pink, pale green, and warm brown lighted in golden yellow. Herman’s ﬂat-faced men have their habitual brutish look. In their company the malevolent old man in a rose and white mantle intently watching the scene is exceptionally expressive.